There was a time – like back in 2017 – when the animal you’d be most likely to give a high five to during National Ice Cream Month would be the dairy cow. But as you know, Nova Nation, this is 2018 when anything can and will happen. So this year, America’s favorite mammalian mascot for all things frozen delicacy is…the unicorn! Don’t believe us? Search #unicornicecream. Check out Time magazine. Go to Target. We’ll wait. We also want to recommend a trip to Penn State’s Creamery next time you’re in Happy Valley. We remember our visits there so fondly after a library conference or two! We’ve featured three of their most iconic flavors in our word search. 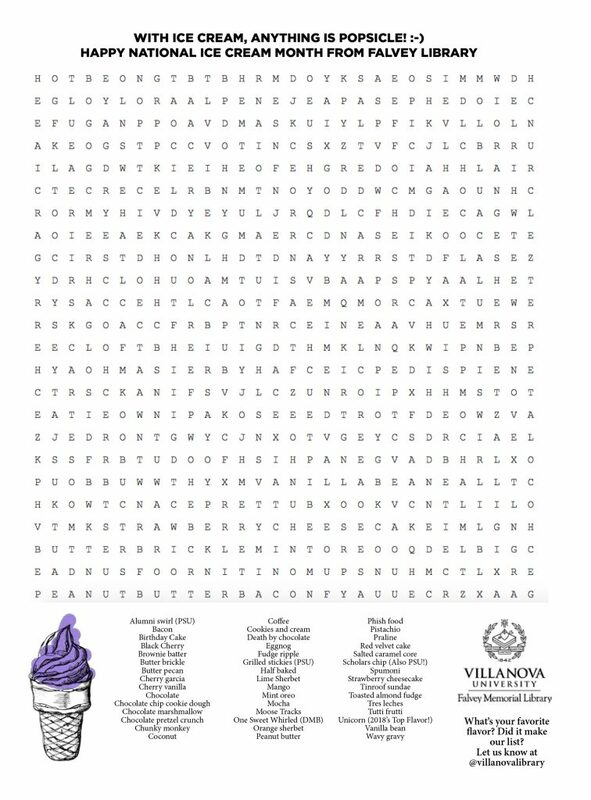 In the meantime, cool off and relax this afternoon with our new ice cream-flavored word search. Download and print from here, or pick one up at the library’s front desk. Have fun – but don’t get any frosty swirly edible glitter bits stuck in your keyboard! Links provided by Deborah Bishov, Falvey’s Social Sciences/Instructional Design Librarian, and ice cream enthusiast.